The Franklin River is a wild river in the midst of true wilderness. Its unique value was officially recognised in 1982 when it was listed as a World Heritage Area. The rafting trip is physically hard at times and coupled with the fact there are no roads out/no other people, makes the challenge of this a real adventure. You will get your heart pumping negotiating rapids and cascades, yet at other times you will enjoy tranquil stretches of the river and peaceful gorges with untouched forest leaning out. The untamed waters of the Franklin are able to be negotiated due to the champion guides who are physically fit, knowledgeable, experienced in their craft and for whom safety is paramount. Amazingly, at the end of a day's journey they then cook up a storm using a single-burner stove. It might be steak and potatoes or bush pizza. They even do desserts! Minimal impact camping is practiced with all waste taken out. Falling asleep under rock overhangs to the sound of the river is special. Some points in the river require portaging (carting gear around rapids/obstructions) which is done smoothly due to the experience of the guides. 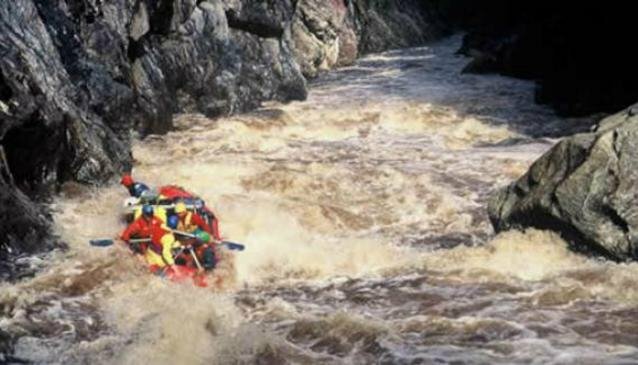 Water by Nature guide a ten day rafting expedition rafting covering the full navigable length of the river. A seven day expedition takes in the Upper Franklin walking out at Mt McCall to a waiting 4WD. This is the point of the start of the journey the for the five day tour on the Lower Franklin. Your tour may take you through the Great Ravine, Serenity Sound, Trojan Rapids, Aesthesia Ravine or by the Pig Trough, Rock Island Bend and Galleon Bluff to name a few. With the seven and ten day tours an optional day trip up Frenchman's Cap (1443 m), can be undertaken. For hikers this is normally a five day return hike. With the five and ten day expeditions ending near St John's Falls you say farewell to the wilderness with either a seaplane flight or yacht cruise to Strahan. Each expedition uses two guides and two rafts paddled by a crew of two to five, with a maximum of ten people per departure. The minimum age is 16 years, or lower by arrangement. There is no maximum age limit. No previous rafting experience necessary.